The collection goes live tomorrow. This is a collection of tales set in the modern American West with characters who somehow dispel the rugged individualist myth, while at the same time giving it new meaning. Jim Stewart says: The first edition of White Ravens was self-published via Smashwords, just to see if I could pull it off. The editing was not rigorous and the whole concept of doing it yourself was fairly new. It was a great learning experience and I’m grateful to Smashwords for the guidance and encouragement. Then, Word Hermit Press offered to publish my novel, Ochoco Reach, and I was very happy at my good fortune. 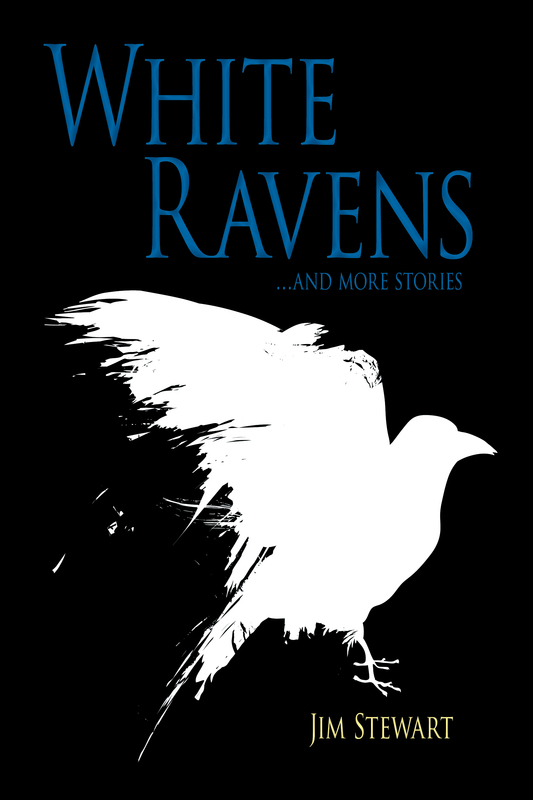 The original version of White Ravens And More Stories languished with very little attention from me or anybody else. I also self-published a short story single called Early to Rise because it made the rounds of literary magazines with no takers. Editors who said they liked the story told me the awkward length of it handcuffed them. So, I included it in White Ravens for this edition. Willy Hayes, one of the main characters in Ochoco Reach, makes her first appearance as a fictional character in Early to Rise. Appearing for the first time anywhere is the story Bleeding Alder, featuring a young Mike Ironwood, the forthright hero from Ochoco Reach. After White Ravens comes Joshua’s Tree, the second Ironwood novel. It should appear in 2019.
robbing the ghosts of places to hide. to again see today’s road. the hot room strokes my sepia skin. I’m beginning a series of pieces written for ancient mariners like me. one another in enraptured embrace. I am more than the sum of my companions. c’mon—atta girl, atta boy, c’mon. I bleed on the page.